More than 300 people attended the forum and the 6 workshops have kept their promises. On September 15th, more than 300 representatives of the worlds of economics, politics and research have come together at the hotel Vatel in Martigny to develop and exchange ideas about “Artificial Intelligence in all its forms”. 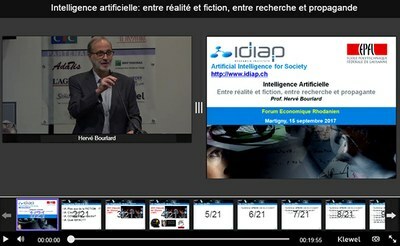 Prof. Hervé Boulard, director of the Idiap Research Institute of Martigny, discussed artificial intelligence from the scientist’s point of view in his talk “Artificial Intelligence: between reality and fiction, between research and propaganda”.